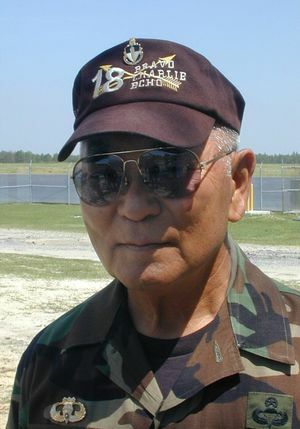 SGM Ernie Tabata, Legend in the Special Forces community, departed on his Final Infil 10 August 2015 . . .
SGM Ernie Tabata is an SF legend, is Distinguished Member of the Regiment, his service, military and as civilian instructor spanned 59 years. He trained and was loved by legions of SF demo men. Sergeant Major Ernest K. Tabata began his military career in June 1946 as a volunteer in the Hawaiian Territorial Guard. Two years later he enlisted in the U.S. Army at Schofield Barracks, Hawaii, and completed the advanced combat engineer school at Fort Belvoir, Va. On June 1950, SGM Tabata found himself among the first American Soldiers sent to South Korea to repel the invasion by the North. He was assigned to the 14th Combat Engineer Battalion, 1st Cavalry Division. Following Korea, SGM Tabata returned to Hawaii and received an honorable discharge in September 1952. He re-enlisted in the Army in January 1955. SGM Tabata served the next six years as a paratrooper in the 82nd and 11th Airborne Divisions. In January 1961, SGM Tabata became a “triple volunteer” when he applied for duty with the U.S. Army Special Forces. After his Special Forces training at Fort Bragg, SGM Tabata volunteered for a clandestine mobile training team, named “White Star.” Led by then-Lieutenant Colonel Arthur “Bull” Simons, the team arrived in the Kingdom of Laos in October 1961 and began training the Royal Lao Army. In August 1964, SGM Tabata received orders to the Republic of South Vietnam. There, he joined the 5th Special Forces Group (Airborne), and trained the Montagnards. In January 1965, reassigned to the 1st Special Forces Group (Airborne) in Okinawa, SGM Tabata served as a team sergeant on a HALO team. A few months later, SGM Tabata and his detachment went to Korea to prepare South Korea’s elite White Horse Division for combat prior to its departure for South Vietnam the following year. SGM Tabata returned to South Vietnam in November 1965, his third combat tour, for assignment to the Military Assistance Command, Vietnam Studies and Observation Group, or MACV-SOG. Returning to Fort Devens, Mass., in August 1970, SGM Tabata served with the 10th Special Forces Group (Airborne) and with the 12th Engineer Battalion. Upon his promotion to sergeant major, he served as the senior enlisted advisor to the assistant division commander, 8th Infantry Division, in Mainz, Germany. His return to Special Forces came in 1978, with an assignment to the 7th Special Forces Group. SGM Tabata retired in December 1981 after 30 years of active-duty service. In November 1984, he returned to the Special Forces Training Group as a civilian instructor. 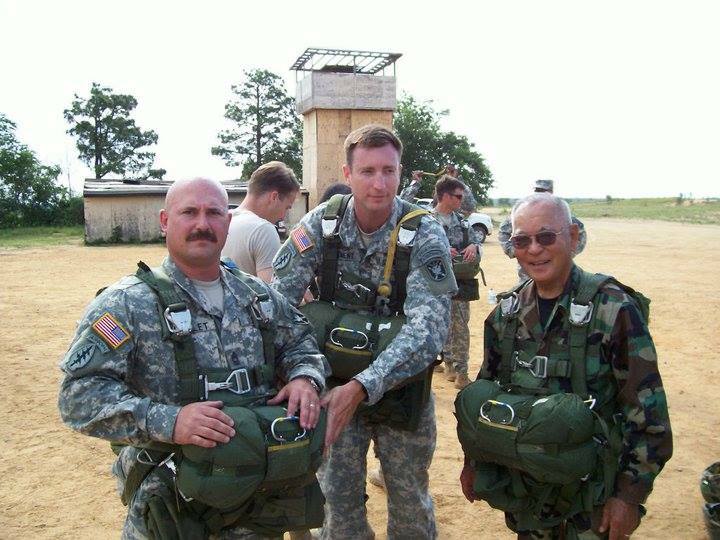 SGM Tabata also participated in static line parachute jumps as required in the course of his duties, well into his seventies. SGM Tabata - known affectionately as "Sensei" (teacher) to Green Berets assigned to 1st SFG in Okinawa - taught generations of Special Forces engineers. Tt was an honor and a privilege to be his student. Memorial service information is forthcoming. We will miss you Sensei, see you at the Final Rendezvous Point . . .
We honor them....The vikings will raise their mead glasses high when he walks in to the long house in Valhalla. What a testimony. Thank you and prayers for the family. It was my honor to be a member of your Company back in the early days on Okinawa and the Under Water Training unit of 1st SF Gp.